"This is a great Fourth of July people pleaser. Or anytime, especially if you live under the hot Southern summer sun. Feel free to experiment with different flavors of sherbet!" 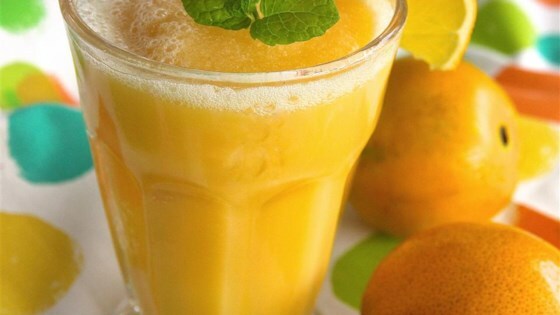 In a blender, blend the orange juice, water, orange sherbet, vanilla, confectioners' sugar, and ice until smooth. A refreshingly fun mocktail for 4. This was a great drink that I love to make. Everyone always wants one when I make it. I would recommended this drink to anyone who wants a cool drink. Very good recipe, the vanilla was a tad overwhelming, I suggest using 1/2 teaspoon instead of a full teaspoon.